Cigar smoking is a deep-rooted and longstanding art taken up by the finest gentlemen throughout the centuries. And, as any authentic gentleman could tell you, a cigar smoke truly is one of the finer pleasures of life. If you haven’t ever tried it, cigar smoking is something that you ought to consider as a modern gentleman. It’s not a difficult hobby to get into, nor expensive, if you do it right. Before beginning any hobby, it’s imperative to be informed about what it is that you’re doing. The most basic knowledge in terms of cigar smoking is obviously what a cigar is and how it’s made. Theoretically, cigars are tightly wound bundles of tobacco, though they really are more complex than that. It is thought that they originated over a thousand years ago and were really invented by the Mayans. Christopher Columbus discovered tobacco and its uses when he landed in the islands. It got back to Europe and shortly thereafter cigars were being commercially manufactured in Spain. 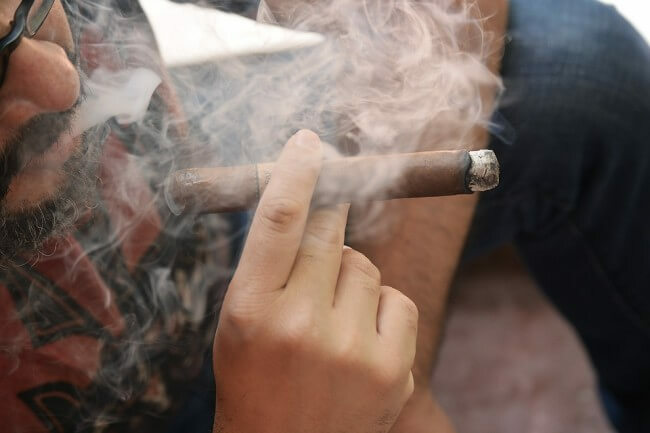 Soon, the Spanish realized that Cuba was the ideal place for tobacco production, and has remained a famed center of cigar manufacturing ever since. Today, cigars are rolled both by hand and by machine, and come in all sorts of flavors and assortments. The best quality tobacco and cigars come from Brazil, Honduras, the Dominican Republic and, of course, Cuba. There are countless brands and tastes to choose from. So, as a beginner, where do you begin? The best place to start is to come to know what types of cigars are available. Cigars are made both ways. Of the two choices, hand rolled is preferable both for beginners and aficionados. Machine rolled cigars can contain additives and chemicals and don’t taste as good. Hand rolled normally use pure tobacco, as well as a tobacco based binder (the glue that helps the wrapper and filler to stay together), and a tobacco wrapper. Then, they are aged for months. This means better flavor, better quality and less risk. So, first rule of thumb: look for a hand rolled cigar. Second rule of thumb? Find a mild-flavored brand to begin with. Purchasing the correct type of cigar is essential. If you try a strongly flavored one on your first smoke, it will likely ruin the experience for you. Buying a cheap cigar in some service station or some similar place is also a bad idea, as they have not been properly stored and thus will not provide a pleasant, relaxing experience as a cigar should. So, it’s crucial that you purchase well. Keep in mind that you don’t need to start with the most expensive cigars out there, until you’ve gotten a taste for them and have decided to take cigar smoking up as a serious hobby. As long as it has a smooth, less-intense flavor, there is no need to empty your wallet on a cigar. Some highly recommended starter cigars are these. These cigars are very mild and almost creamy. They aren’t anything too complex or heavy, but also provide a relaxing experience. These are hand made in Habana, Cuba, and if you can get ahold of them, you’ll have a fantastic experience. The blend is something like chocolate, vanilla, wood, spice, honey, and sweet latte. This is a My Father Cigars product, and has been considered one of the best in 2012. Chocolate, nuts, and nutmeg shine through. 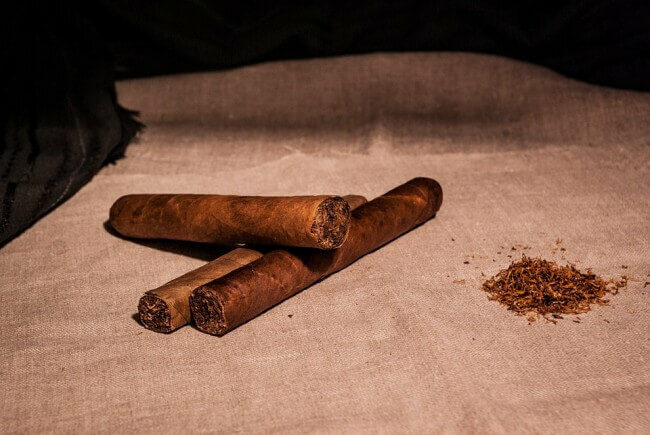 Famous for their aroma, these cigars are made from Dominican and Nicaraguan tobacco. They are rich, smooth, and flavorful. They are complex but not overwhelming. This cigar has hinds of pepper alongside coffee and cream. Now, you have your cigar in hand. What do you do? The first step is to cut your cigar. There are small, guillotine/style cutters, as well as special cigar scissors available. Some men use a sharp knife, V-cutter, or other items, including teeth. But, a true gentleman will have appropriate tools to cut the cigar. I recommend the guillotine cutter with two blades, so as to get a smooth cut without smashing the head of the cigar. The cut should be made at the head just past the shoulder. That means that just where the cigar evens out (stops being round) is where you ought to cut. If the cigar is a torpedo or pyramid shape, you can cut just before the shoulder, so as to not lose too much cigar. When lighting your cigar, remember that a gentleman should always use a wooden match or a butane lighter. Candles, stoves, lighters using lighter fluid, and candles can all change the taste of the tobacco. Hold it at a 45 degree angle over the flame, and slowly rotate to evenly ignite the foot. The outer layers should be toasted, given a head start. Then, assure that the filler is completely lit. Slowly puff while rotating. Once completely lit, let it rest for a minute or so. Then, enjoy. Whether or not you leave it on depends completely on you. Some gentlemen say it leads to interesting conversations, while others say it’s too flashy. Many times, though, removing the band damages the wrapper, and we can’t have that! A true gentleman should have a humidor, which is to store the cigars and protect them from humidity and other elements that can change their flavor or composition. If you’re not sure that cigar smoking will be a full time hobby, however, it may be better to hold off on the humidor until you are sure. Use a Tupperware container to store your cigars, and don’t purchase more than you can use in a few days’ time.